This edition of NetworK could arguably be called “sensational”, as we bring you news of the result of almost thirty years of our research into one pattern – the Four Flowers Variant. ​We feel that our findings bring clarity and vital context to Carnival Glass in its entirety, casting new light on how it all began, over a century ago. In reaching our conclusions and presenting our evidence for the solution of this long-standing mystery, we believe we have also uncovered the maker of the glassware on the Goddess Epergnes (Goddess of Athena and others). As part of the entire process we rigorously tested ourselves by “playing devil’s advocate”, but we only succeeded in strengthening and further validating our conclusions! ​Above left: Four Flowers, made by Dugan, Eda and Riihimaki. Above right: Four Flowers Variant, maker under discussion. The Four Flowers was made by Dugan, and almost identical versions were also made by Eda Glasbruk (Sweden) and Riihimaki (Finland). The main difference between them is that the Scandinavian versions have a ground base and were made in slightly different colours than the Dugan ones. 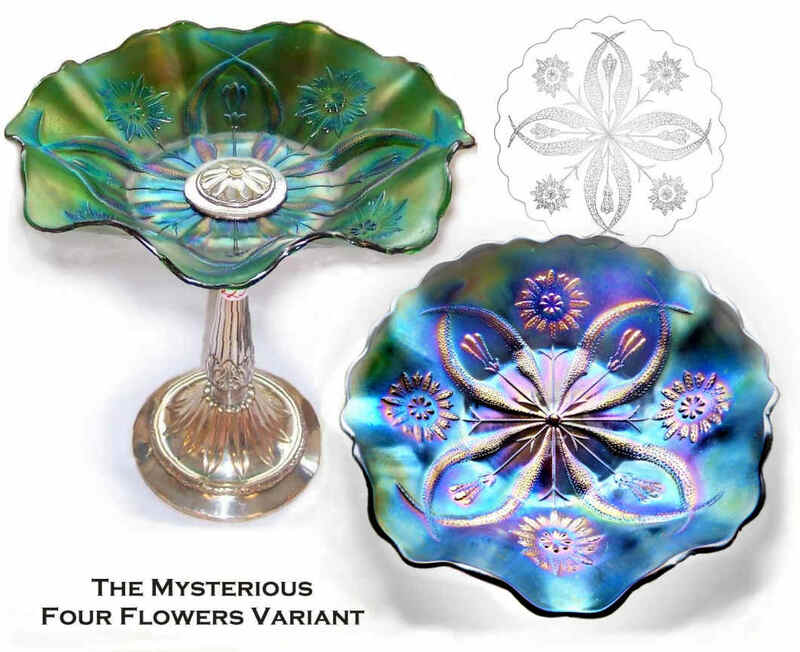 Don Moore called the Four Flowers Variant one of the “Jewels” of Carnival, listing the large plate as one of his Top Fifteen, while Marion Hartung felt it must be a Millersburg piece as it was so lovely. The colours that the Four Flowers Variant is found in are amazing and often absolutely dazzling. ​Green, purple and amber – each in a myriad of shades - some deep, some pastel, some verging on frosty. And it is this fundamental fact – those very specific colours – that proved to be very significant and pivotal in the search for the answer. Above: ​​Four Flowers Variant - a purple plate and an amber bowl. Below - a stunning large sized plate in emerald green. As we followed the evidence trail, we then stumbled across another little clue … these flowers on their long stems, with the curving side leaves and the intervening long buds. We did a double-take! Try as we might, we couldn’t escape the fact that it reminded us of the pattern on the Four Flowers Variant. Do you know what Carnival Glass maker this early trademark (below, left) belonged to? The trail of evidence is fully researched: it took us on an interwoven path that is far too long to report in this ezine. We have written out the full story, illustrated all the evidence, and presented everything fully for you in a major Two Part feature. We tested our evidence rigorously to see if we could dismantle our theory, but we simply succeeded in bringing in yet more supportive evidence! Don't miss this sensational investigation. Discover the maker here: Four Flowers Variant - “Untangling The Gordian Knot”. And now, a fascinating mystery seen in the newspapers. This time we go to Junction City, Kansas … and the date was November, 1909. This wonderful ad on the right was for Pegues Wright Dry Goods Store, and the glassware shown here was in the “Economy Basement” section. Four Northwood bowls are illustrated, but in only three patterns. 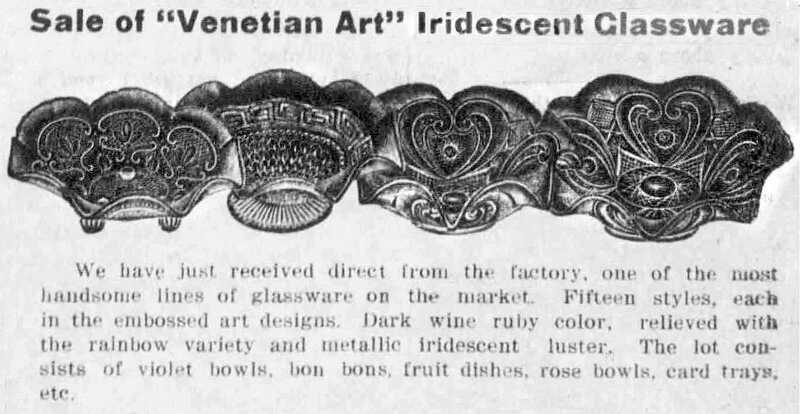 The ad states that the glass was “dark wine ruby” with a “metallic iridescent luster”. So what are the patterns shown? On the right of the ad are two bowls, which seem to be in different sizes. The pattern is undoubtedly Northwood’s Valentine, pictured below in marigold, courtesy of Seeck Auctions. ​​But here’s where the puzzles begin. Valentine is only known in marigold, and in the large (master) and small berry bowls. ​But the ad says “dark wine ruby”, so was this pattern originally also made in purple too? If we believe the ad, that might be a possibility. ​The next bowl in the ad (second from the left in the newspaper ad) is Northwood’s Greek Key and Scales, with a pedestal or domed foot, shown here in green, courtesy of Seeck Auctions. A theme is beginning to emerge from the ad … both Valentine and Greek Key and Scales are exterior designs only. Their interiors are plain. ​However, the illustration in the newspaper ad infers that the design can be seen from the front, but that’s not so. In fact if the bowls were in “dark wine ruby” it would have been impossible to see through them. ​Northwood’s Valentine in marigold (left) and Greek Key and Scales in green (above). Courtesy of Seeck Auctions. So, what’s the last pattern in the ad … the one on the left? The others are exterior designs, so it seems likely this one is too. But what on earth is it? Have you seen this pattern in Carnival? We certainly haven’t. In fact, it is Northwood’s Lattice Medallions, and as far as we are aware, it is not known in Carnival Glass at all, but is mainly found in opalescent glass, as shown on the right in opalescent green. So, what are we to deduce from this intriguing ad? If we accept that the illustration was correct, and those items were exactly what was on offer, then it seems Northwood’s Valentine pattern was also made in purple Carnival. 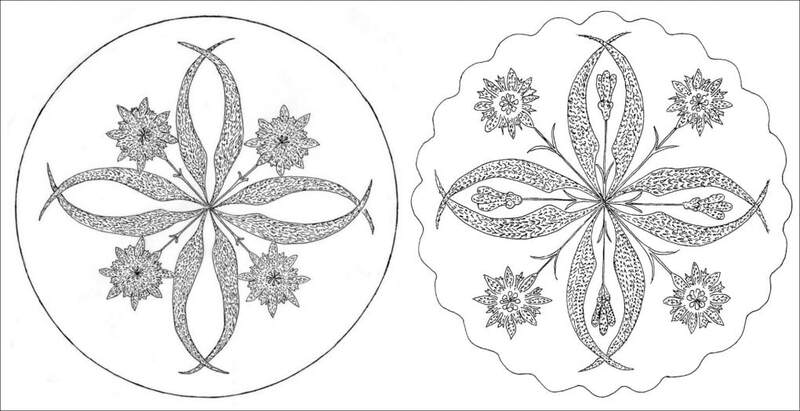 And even more exciting is the possibility that the Lattice Medallions pattern was also made in Carnival Glass. ​Fenton introduced their beautiful Cobalt Marigold colour in January, 1984. The delicious iridescent effect was achieved by applying marigold (ferric chloride) iridescent spray on cobalt blue base glass. The items illustrated here were from the Fenton 1986-87 catalogue – shown here courtesy of the late Frank Fenton who gave us this beautiful extract during the time we were researching in the Fenton archives at Williamstown. The picture below probably gives the game away! Of course, it’s the wonderful Fern Brand Chocolates “Advertising” or “Lettered” piece that was made by Northwood. ​Fern Brand Chocolates 6 inch plate, amethyst. This fabulous item is known only in the small six inch plate form, or with turned-up handgrip edges (both single and double handgrip). ​It was made by Northwood and is marked with the letter N - it is one of the more frequently reported “Advertising” or “Lettered” pieces. The exterior design on the Fern Brand pieces is Northwood’s Basketweave. It’s interesting to note that they were made in only one Carnival colour - amethyst (sometimes also described as purple or lavender). The iridescence can be deceptive, as ​Northwood often managed to capture a sea-green shimmer in the colours. The piece may look green (as the one in the photo here suggests) but check the base colour and you’ll find it’s amethyst. ​One of the most popular and unique features on our website is our "Carnival Glass Times", where in true investigative journalistic fashion we uncover The Stories Behind The Glass, bringing Carnival Glass to life through captivating stories about Carnival Glass makers, advertisers, consumers and most recently, glass collectors. The latest addition is the story behind the Fern Brand pattern. OK - we can see there is a connection between Fern Brand chocolates and the Carnival Glass piece bearing the same name, but there must surely be a bigger story than the two just having the same name ... of course there is! ​And where does linseed possibly come into it?